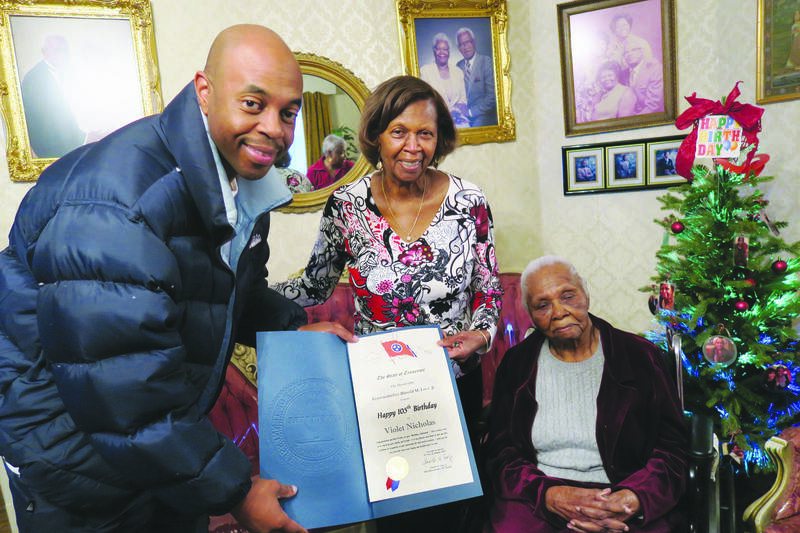 NASHVILLE, TN — Mrs. Violet May Nicholas, 66-year resident of Nashville, celebrated her 105th birthday with family and friends at home on Wednesday, January 6, 2017. Family and friends of Mrs. Nicholas from all over the United States joined in the joyous celebration. When she was 13 years old, she contracted typhoid fever and was given only 3 weeks to live. After several months however, she recovered, but was left almost completely deaf by the illness. She did eventually regain most of her hearing. (Over the past 2 – 3 decades, however, her hearing has deteriorated to the point that she is functionally deaf). As a teenager, thankful for having recovered and undeterred by her hearing loss, Mrs. Nicholas went on to finish secondary school in Spanish Town, Jamaica. She was an excellent student and eventually received certificates in Pharmacy and Midwifery in Jamaica. In April of 1942, the Mrs. Nicholas and her husband welcomed their first child Gertrude Elaine. Their second daughter, Allison Eleanor, was born in July 1944. In 1945, Violet’s husband immigrated to the United States in order to pursue his childhood dream of becoming a medical doctor. Violet followed her husband to the U.S. in 1949. Having no relatives or means of financial support in the U.S., Violet had to leave her two young daughters with relatives in Jamaica when she came stateside, while she looked for full-time work to help support her husband who was a full-time student for 9 months out of the year. “Leaving my children behind was the hardest thing that I have ever done,” she sometimes reminisces, often with tears in her eyes, even to this day. 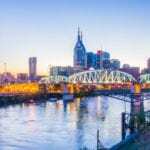 The Nicholases moved to Nashville in September 1950 when Philip was accepted to Meharry Medical College. Mrs. Nicholas has been a very active member of her community. She is a founding member of St. Anselm’s Episcopal Church, and has been an active parishioner there for over 55 years. She served as president of The Auxiliary to the R. F. Boyd Medical Society (the Nashville Chapter of the ANMA) for several years and has faithfully supported the Meharry Medical College Community since she and her husband joined its ranks. With her husband, she sponsored many family members from Jamaica facilitating their immigration to the United States in order to pursue higher education and careers in everything from Medicine to Education. Because they remained living on the same block where they lived after first moving to Nashville in 1950 just 2 blocks from Fisk and 3 blocks from Meharry – Violet and her husband were able to be “parents away from home” to countless Fisk, Meharry and Tennessee State students over the years. Mrs. Nicholas’ legacy is one of a tenacious faith, the pursuit of excellence and education, generosity, hospitality, and “investing in people” – family, friends and her community. Her family members include: daughters, Mrs. Gertrude Nicholas Brooks (Morganfield, KY) and Dr. Allison Nicholas Metz (San Francisco); grandchildren, Dr. Marilyn Metz Jones and husband Anthony Jones, Leon B. Metz, III, Dr. Lionel N. Metz, and Laurence C. Metz (all of San Francisco, CA); and Ernest A. Brooks (New York, NY) and Dr. Philip A. Brooks (Nashville); and great-grandchildren, Meredith Grace Jones and Nicholas Emanuel Jones. SEE MORE PHOTOS ON PAGE B12.